My membership at another institution includes NARM benefits. Will they be accepted by the Crocker? To protect the value of independent membership programs in the region, the Crocker extends reciprocal admission through the North American Reciprocal Museums (NARM) program to applicable members of institutions beyond a 15-mile radius of the Museum and ROAM reciprocal admission to applicable members of institutions beyond a 25-mile radius of the Museum. All reciprocal member institutions may implement reciprocal museum policies as they choose. We recommend you visit narmassociation.org, or bit.ly/ROAMer, or call the institution you wish to visit in advance of your visit to learn about your benefits. Please note that you will not receive membership mailings from the participating reciprocal museum institutions. Depending on your level of membership, your donation is either fully or partially tax-deductible. For the Individual through Associate levels of membership, your membership is 100% tax-deductible. Higher levels of membership have varying amounts of deductibility. 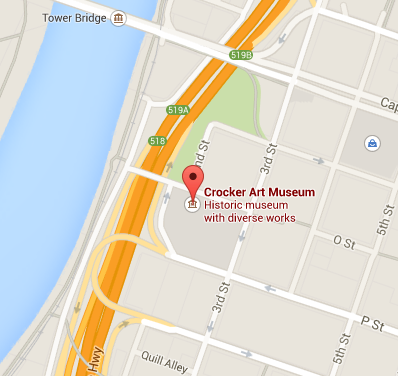 What exhibitions will be at the Crocker, and will there be member previews for them? Visit our website regularly for upcoming exhibitions. For select exhibitions, we will have members-only events, which can include exhibition previews, art-making activities, artist demonstrations, curator talks, music, and more. Watch your (e)mail for invitations to upcoming members-only events. Which programs are free to members? The Crocker regularly offers programs free to members, including family activities like Sketch It, and Wee Wednesday. Associate-level members and above receive free admission to Art Mix for themselves and as many guests as their membership level allows. Free member events are listed in ArtLetter magazine and the Art Interactive program guide. How many program tickets can I purchase at the member price? The number of tickets you can purchase at the member price is equal to the number of guests your membership level admits. Additional guest tickets must be purchased at the nonmember price. Please note that guest passes are not accepted for ticketed programs. How many guests can I bring to special events? Guest privileges vary depending on the type of event; please see your invitation for details. I have old guest passes. Can I still use them? Guest passes have an expiration date and should be used before they expire. If you have a guest pass that does not have an expiration date, you may still redeem it. What is the difference between "guest passes" and the number of guests my membership level admits? How many people receive free general admission with my membership? The number of people admitted depends on your level of membership. The Individual level admits one adult. The Family level admits two adults and any children under 18. The Associate level admits three adults and any children under 18. Contributor and Benefactor levels admit four adults and any children under 18. Your membership is valid for one calendar year from the end of the month in which you join. For example, if you joined January 5, 2015, your membership would expire January 31, 2016. What are the benefits of membership at the Crocker? In addition to supporting the arts and enjoying free Museum admission, members receive a number of discounts and exclusive perks. Click here to view a full list of benefits, including how to get free admission to more than 900 other museums across North America. No. Membership cards are not transferable; only the cardholders are entitled to use the card. The cardholders must be present in order for their guests to receive free admission. I don't have my card(s). Can I still visit the Museum? Yes. Simply provide your name at the Admission Desk, and a Visitor Services Representative will check you in. Please note that if you just became a member, it takes up to two weeks to process and mail your membership card(s). I lost my card/my name is misspelled on the card. Can I get a replacement card? Replacement cards are $10 per card and can be purchased over the phone or in person at the admission desk. Please note membership cards are not transferrable or refundable. You can contact the Membership Office at membership@crockerartmuseum.org or (916) 808-6730. Or you can visit the Admission Desk. Can more than one name appear on my card(s)? Members at the Individual level may have only their name printed on their card. Members at the Family level and above may have up to two names on the cards. Is there a teacher or educator discount? Open to all educators from pre-kindergarten through college-level institutions, our Educator membership provides benefits designed with teachers in mind. The Educator membership is $50/year and includes unlimited general admission for the educator, discounts on educator workshops, automatic enrollment in eNews, and digital subscriptions to ArtLetter (our member magazine), Art Interactive program guide, and the studio class brochure. To join at this level, click here. Yes. Seniors (age 65+) may take a 10% discount off the regular dues for membership levels through the Benefactor level. To receive this discount online, check the "65 or older?" box when completing the form [http://207.7.95.37/join-give/join/join-renew#become-a-member-renew]. Can I pay my dues monthly instead of annually? Yes. The Crocker sustainer program, with automatic monthly payments, provides a convenient way to pay your membership dues and increase the impact of your gift. Instead of receiving renewal notices in the mail each year, simply set up automatic monthly payments with your credit or debit card by calling the Membership Office at (916) 808-6730 (Monday – Friday, 9 AM to 5 PM), visiting the Museum Admission Desk. How do I upgrade my membership level or rejoin online? To upgrade your membership and pay the difference between your current level and your new level, please call the Membership Office at (916) 808-6730 (Monday - Friday, 9 AM - 5 PM). If you would like to rejoin or renew at a higher level of membership, click here [http://207.7.95.37/join-give/join/join-renew#become-a-member-renew]. How do I receive my senior discount online? To receive your senior discount online, check the "65 or older?" box when completing the form. To renew your membership online, click here [http://207.7.95.37/join-give/join/join-renew#become-a-member-renew]. I am having trouble logging into my member account on the Crocker website. How do I log in/reset my password? If you gave us an email address, then you already have an online account and thus should not create a new one. If this is your first time completing an online transaction with the Crocker, for your login ID please use the email address you provided on your membership application and then click "Forgot/Reset Password." If you did not give us an email address, or if it has changed, please contact the Membership Office at membership@crockerartmuseum.org or (916) 808-6730 to set up your account.